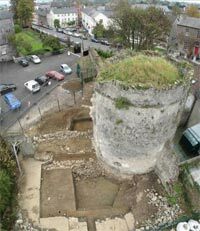 An excavation was carried out by Kilkenny Archaeology at the medieval town wall at Talbot’s Tower, the south-west angle of the city’s Hightown fortifications. The excavation formed part of a programme of conservation measures for the walls that are being undertaken by the Kilkenny City Walls Steering Committee. The excavation uncovered rare evidence for the earliest Anglo-Norman defences on the site. These comprised a deep ditch which was overlooked by an enormous earthen bank which would have been topped by a stout oak palisade. Sealed beneath the bank was an ancient agricultural soil from which barley grains were obtained. These were radiocarbon dated to the ninth century AD and provide the oldest definite evidence for agricultural activity from the Kilkenny area. The earthen defences were replaced in the mid-13th century by the stone tower and walls, which survived relatively intact until the 20th century. Conservation work is ongoing at Talbot’s tower and it is envisaged a public park will be built around the tower in the near future.